SSuite File Shredder is a handy software that helps to delete files permanently. Before starting the deletion process, it also lets you encrypt files. It’s a unique feature of this file deletion software that is not present with many similar software. This also increases the security level to remove files permanently. Based on your requirement, you can also set number of times your files space should be overwritten with random data. Thus, it’s a very useful software which helps a lot when you want to delete those files that you don’t need any longer. In screenshot below, you can see its interface where it provides options to delete files permanently. It is one of the easy to use software that falls in this category. So from experts to novice users, it is worthy to try. However, it deletes files with default deletion method. You cannot choose data deletion algorithms. You may also try these free file deletion software that provide data deletion algorithms: Disk Pulverizer, TweakNow Secure Delete, and Freeraser. How To Delete Files Permanently Using This Free Software? SSuite File Shredder comes in a zip file. It is a very lightweight software and portable also. Zip file of this software is 740 KB in size. You can download that zip file with the help of link I have placed at the end of this review. Complete the download process and then extract the zip archive. After this, you need to execute application file named as ‘FileShredder’. As it is a portable software, so it will run directly, and interface will open up. Its interface provides all the options at left side. Using Add Files button, you can add multiple files on its interface that you want to delete. 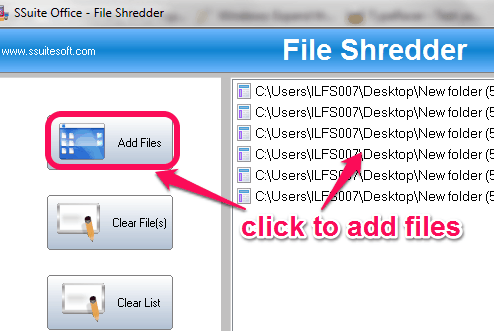 If any file is added by mistake, then you could even remove that file from the list using Clear File(s) button. After adding the files, you need to set Paranoia Setting. This setting is used to set how many times the input files space should be overwritten by random data. By default, it will be set to 35 times. But you can increase/decrease this value. Maximum value can be set to 50 and minimum value is 1. After this, you can start the shredding process. But before starting the shredding process, it will be good, if you will enable encryption process. 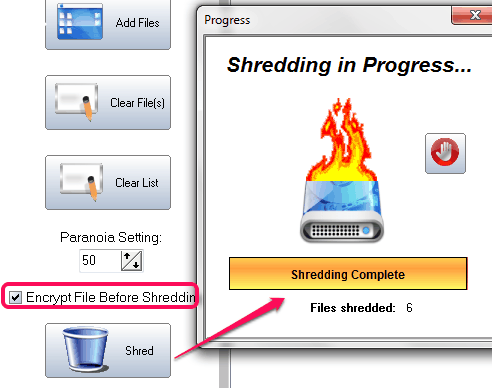 This will help you to first encrypt files on shredding process, and then delete those files. This would help a lot to make it impossible to recover deleted files. So that, even after using file recovery software, no one can get the files in correct format. That’s all you have to do and you can start the deletion process. If files size is quite large and number of repetitions are more, then deletion process will take some time. But final results will be satisfactory. SSuite File Shredder is quite useful data deletion software. Although it doesn’t provide deletion algorithm to delete files permanently, but encryption feature to delete files is unique and beneficial. 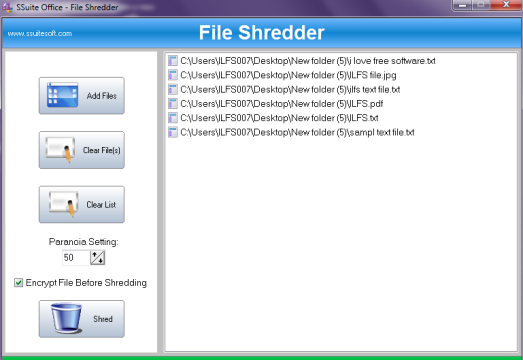 Get SSuite File Shredder free.